Accepting payments just got even easier for Bookeo users: We’ve integrated with Square, one of the world’s most popular payment platforms and card processing system. Square works seamlessly with Bookeo so you can easily take payments in-person and online from your booking page. You can opt to accept mobile payments, online payments, or both with Square. With Square, you can create an account in minutes and instantly start accepting payments. There are no monthly fees, long-term commitments and a merchant account is not required. 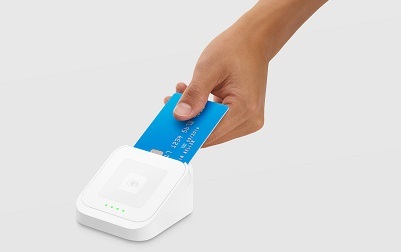 Square accepts all major debit and credit cards and funds are deposited within 1-2 business days. Square also offers chargeback protection at no cost to help keep your business secure. Square is currently available in the US, Canada, Australia, UK, and Japan. You can quickly set up a Square account here. With Square POS you can simply swipe, dip or tap credit cards via your mobile device, and the payment is automatically recorded into your Bookeo account. This is great news for many businesses. If you accept in-person or on the go payments, you no longer have to manually enter credit card numbers when you’re offsite. Taking payments with Square POS also reduces your exposure to charge backs, because these are considered “card present” transactions. What’s more, your processing fees for swiped, dipped or tapped payments are lower than those for keyed-in payments. To accept in-person payments with Square POS, you’ll need the app and a Square magstripe reader – free with signup and shipped within 10 days. If you want, you can purchase additional hardware at www.squareup.com/shop. You can enable the integration with Square POS payments in your Bookeo account, under Settings>Online payments. Please note that you do not need to use Square for your online payments in order to use Square POS: you can use Square POS for in-person payments and any online payment gateway supported by Bookeo for online payments. Charging a credit card with Square POS is very easy, and the transaction is automatically recorded in Bookeo. You can learn more in our tutorial here: https://support.bookeo.com/hc/en-us/articles/360018197191. You can also use Square to accept online payments directly from your booking page. Bookeo’s integration with Square means that your customers are not redirected to a different website to pay – which can cause confusion and lost sales. Moreover, Square is a full payment gateway: it allows you to collect credit card details, charge recurring billing, and issue refunds for online payments (not POS payments) from the Bookeo dashboard. If you already have a Square account, you can quickly connect it to your Bookeo account. If not, simply sign up for a Square account directly from within Bookeo. You can learn more in our tutorial here: https://support.bookeo.com/hc/en-us/articles/360018196931-Integration-with-Square-E-commerce. Let us know how it’s working for you. We’re excited about our new integration with Square, and we’d love to hear what you think. Please let us know how it’s working for your business. Wishing you easy in-person and online payment processing with Bookeo and Square.